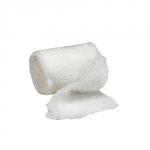 Gauze rolls are layered, woven cotton that is rolled tightly and sealed in individual packaging. 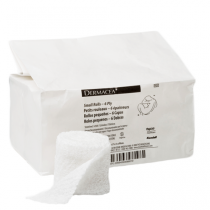 Choosing a gauze roll comes down to a few factors; ply, usage and sterility. Gauze rolls for the most part are very similar from one brand to another. 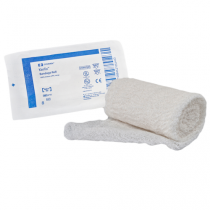 There are two factors one will want to look at with these wound care products. The first is thickness, or the number of ply layers the rolled gauze has. The most popular thickness is 6-ply gauze rolls. This is a fairly thin gauze that makes it easy to wrap multiple layers, gaining more control of the thickness in the desired areas. There are different applications for gauze rolls. The gauze you purchase should match the application. As a primary wrap, the gauze should be sterile because it is resting direction on the wound. Rolling it around a limb or abdomen will also help as a means of affixing the dressing. Non-sterile gauze rolls could be used as a primary dressing for light wounds, using an anti-biotic ointment, but are primarily used as a secondary wound dressing to absorb any exudate that makes it through the first layer. 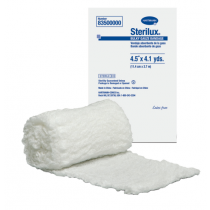 The second factor is gauze roll sterility: non-sterile and sterile. 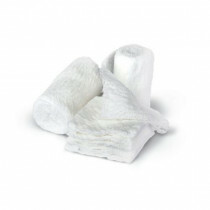 Sterile gauze rolls are provided in their own special individual packaging that is airtight. Non-sterile gauze will be either packaged loose in paper wrapping and plastic cups, or loosely packed in sleeves. Non-sterile gauze is typically used for secondary wrap -- an absorber that backs a primary dressing to take up any exudate should it soak through the first layer. It can also be used as a primary dressing with an antiseptic topping. 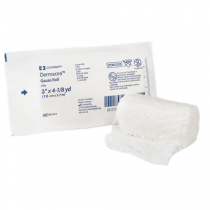 Sterile gauze is to be used in direct contact with the wound and will have the lowest chance of cross-contamination as it is hermetically sealed. 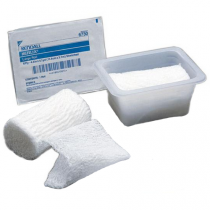 The following information will include popular gauze roll selection from Vitality Medical, both sterile and non-sterile, and with various ply thicknesses. 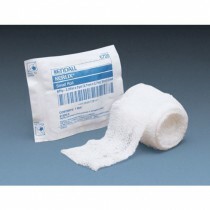 Sterile Gauze Roll: Kerlix Gauze Bandage Roll - Made of 6-ply cotton, these rolls are fluffed to make slightly thicker with a better ability to absorb. 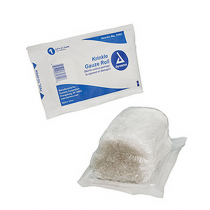 Sterile Gauze Roll: Krimped Gauze Bandage Roll -- By AMD Ritmed, the 6-ply roll is 'krimped' to provide more space for exudate absorption. 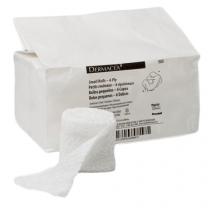 Sterile Gauze Roll: Dermacea Low-Ply Gauze Rolls -- This is uniquely thin at 3-ply thickness to allow better wrap control as well as providing mild compression and support. 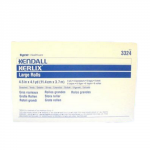 Non-Sterile Gauze Roll: Kerlix Non-Sterile Gauze Rolls -- Offered in 6-ply cotton, they come small to extra-wide at 4 1/2 inches. 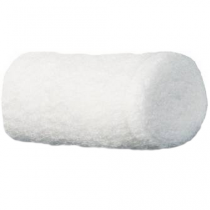 Non-Sterile Gauze Roll: Curity Practical Gauze Rolls -- These come very large, unique in that they are 12 inches wide and 56 inches long at 1 pound of rolled cotton mesh, which can be sterilized with an autoclave. Non-Sterile Gauze Roll: Transelast Classic Gauze Bandage Rolls -- For those who need a narrow secondary wrap that works well with hand, feet, and wrapping digits as a secondary dressing or means of securing fingers or toes. Firstly, it is important to maintain a sterile zone. That means using sterile gloves, applicator swabs, and making sure any dressings used are sterile too. Keep in mind that touching non-sterile items will contaminate gloves or implements, so be careful not to cross-contaminate. Next, the wound must be clean and dry. Then, wrap the affected area or primary dressing. Lastly, if securing with a tape or adhesive, do not secure it so tightly that the dressing can't shift with the body's movement. Depending on the amount of exudate, you will change the gauze daily, or multiple times a day if it is a new wound. When doing so, make sure you have a bio-hazard bin, or a safe disposal location for the soiled bandages. Consult with your doctor or nurse as scheduled or immediately if the wound appears to be infected or unchanged after several days. For deep or necrotic wounds, make sure to consult a doctor or woundcare nurse before selecting a new gauze wrap. But from the selection of gauze rolls on Vitality Medical, you will find several choices to discuss with them. 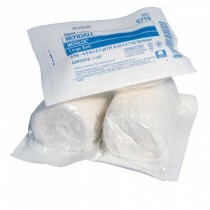 Gauze Rolls (fluff roll, sterile gauze roll, cotton rolls) from Kendall, AMD Ritmed and Invacare. 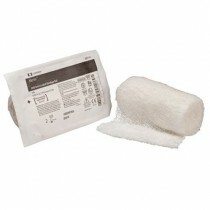 This selection also includes Kerlix, Curity and Iqa gauze rolls. 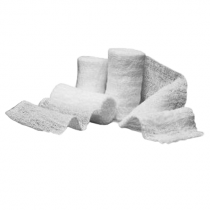 Save on gauze rolls, order online today. Gauze Rolls are useful when you need a custom-size piece of gauze. 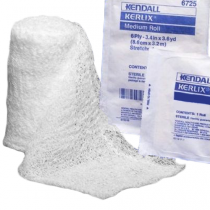 The gauze rolls are made by our top manufacturers including Kendall, AMD Ritmed and Invacare who manufacture brands like Kerlix, Curity and IQA gauze rolls. 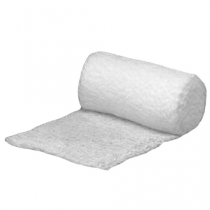 We carry cotton rolls, sterile gauze rolls, fluff rolls, krimped gauze rolls and soft conform rolls. 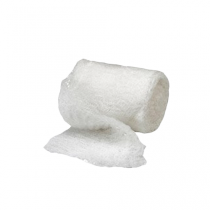 Many of our gauze rolls are made of 100% cotton and are designed to protect the wound.